In 2001, the Permanent Court of Arbitration’s arbitral tribunal, in Larsen v. Hawaiian Kingdom, declared “in the nineteenth century the Hawaiian Kingdom existed as an independent State recognized as such by the United States of America, the United Kingdom and various other States, including by exchanges of diplomatic or consular representatives and the conclusion of treaties (paragraph 7.4).” The terms State and Country are synonymous. In response to the Queen’s conditional surrender of her authority, President Grover Cleveland initiated an investigation on March 11, 1893, with the appointment of Special Commissioner James Blount whose duty was to “investigate and fully report to the President all the facts [he] can learn respecting the condition of affairs in the Hawaiian Islands, the causes of the revolution by which the Queen’s Government was overthrown, the sentiment of the people toward existing authority, and, in general, all that can fully enlighten the President touching the subjects of [his] mission.” After arriving in the Hawaiian Islands, he began his investigation on April 1, and by July 17, the fact-finding investigation was complete with a final report. Secretary of State Walter Gresham was receiving periodic reports from Special Commissioner Blount and was preparing a final report to the President. 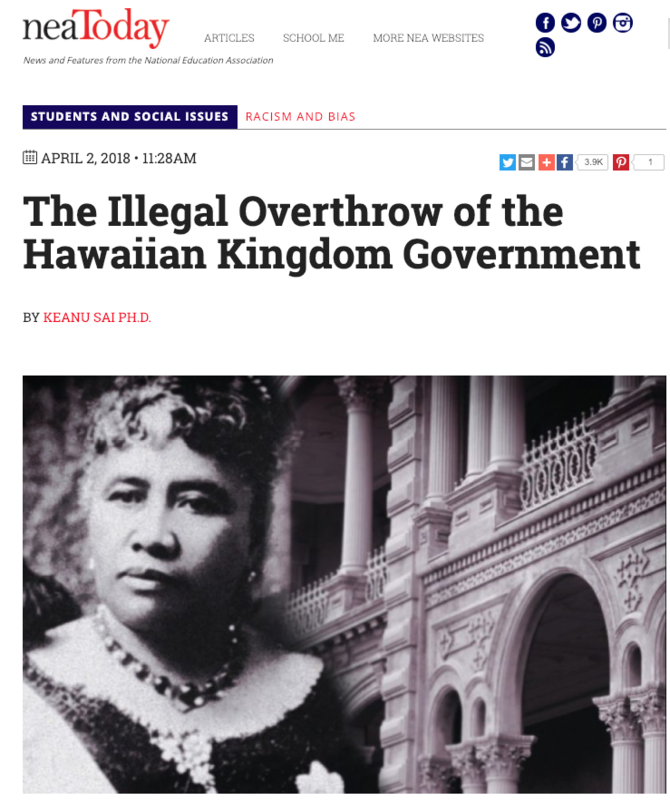 This entry was posted in Education, International Law, National by Hawaiian Kingdom. Bookmark the permalink. I always appreciate the clarity and depth of historical facts shared on the Hawaiian Kingdom blog. Please incorporate the digital documents that are now available at the Hawaiian Mission Houses Digital Archive. It includes handwritten notes between Stevens and Dole. The world needs to see this collection that was hidden from the public for 125 years. Start with item #881 and goes through #923. “Kingdom of Hawaii – 1893.01.16 – By Authority ,” Hawaiian Mission Houses Digital Archive, accessed January 16, 2019, https://hmha.missionhouses.org/items/show/881. After 144 years as a member of UPU the U.S. is withdrawing its membership effective October of 2019. Historical information show that the U.S. joined the UPU seven years before the Hawaiian Kingdom. The U.S. already pulled itself out of the UN Human Rights Council back in June of 2018. Mahalo for the information I was not aware of their withdrawal. Seems like they are trying to remove themselves from institutions and treaties that can hold them accountable. If this trend continues soon they will remove themselves from the United Nations General Assembly. Isolationism is the end result. After looking a little closer at the September 11, 1883, postal convention between Hawaii and America concerning Money Orders, (link above) I noticed that Walter Q. Gresham was a party to that instrument as the Post Master General of the United States of America. Gresham broke from the Republican party in 1892, to support then U.S. democratic Precedential candidate Grover Cleveland, later to serve as President Cleveland’s Secretary of State. The same individual who conveyed the final-report from a fact-finding investigation conducted by Special Commissioner James Blount to President Cleveland concerning U.S. involvement in the Hawaiian islands surrounding January 16, 1893. W.Q. Gresham died on May 28, 1895. (Did they know 10 years in advance?) Hmmm? Perhaps before the United States of America is allowed to exit the UPU, it should comply with the last paragraph of Article 7, to the Hawaiian Kingdom as a condition for exit. IMHO anyway. I am presently without knowledge or information as to whether the Uniform Commercial Code (UCC) is a subsidiary of the Universal Postal Union or tied to it in some way having an affect on global commerce?